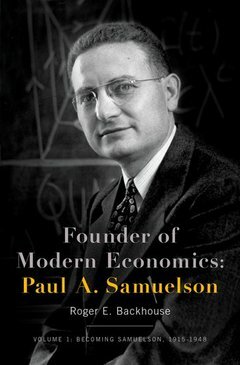 Founder of Modern Economics: Paul A. Samuelson Backhouse Roger E.
Auteur : Backhouse Roger E.
Paul Samuelson was at the heart of a revolution in economics. He was "the foremost academic economist of the 20th century," according to New York Times, and the first American to win the Nobel Prize in Economics. His work transformed the field of economics and helped give it the theoretical and mathematic rigor that increased its influence in business and policy making. In Founder of Modern Economics, Roger E. Backhouse explores the central importance of Samuelson's personality and social networks to understanding his intellectual development. This is the first of two volumes covering Samuelson's extended and productive life and career. This volume surveys Samuelson's early years growing up in the Midwest to his experiences at the University of Chicago and Harvard University, where leading scholars in economics and other disciplines stimulated and rewarded his curiosity. His thinking was influenced by the natural sciences and he understood that a critical, scientific approach increased insights into important social and economic questions. He realized that these questions could not be answered through rhetorical debate but required rigor. His "eureka" moment came, he said, when "a good fairy whispered to me that math was a skeleton key to solve age old problems in economics." Backhouse traces Samuelson's thinking from his early days to the publication of his groundbreaking book Foundations of Economic Analysis and Economics: An Introductory Analysis, which influenced generations of students. His work set the stage for economics to become a more cohesive and coherent discipline, based on mathematical techniques that provided surprising insights into many important topics, from business cycles to wage and unemployment rates, and from how competition influences trade to how tax rates affects tax collection. Founder of Modern Economics is a profound contribution to understanding how modern economics developed and the thinking of a revolutionary thinker. Roger E. Backhouse is Professor of the History and Philosophy of Economics, University of Birmingham.